More giveaways! Check it out! Be sure to comment, reblog, and follow! HEY GUYS! <——- capital letters for excitement! Well… because I have reached 200 Followers!!!!!!!! :O <—– genuine shocked face! I woke up this morning to check my emails and messages and I couldn’t believe my eyes when I saw…200 written on my little “stats” page!! Guys, I’m ridiculously overwhelmed and grateful for all the support I’ve been getting. I never imagined that I would 2 followers… never mind 200! As i’ve said numerous times before, I started blogging away just as a bit of fun and to get all my crazy ramblings out of my head and into something productive. The fact that 200 if you are now following these crazy ramblings of mine is just astounding and it makes me smile a lot! The giveaways are just pouring in my Fancies! Check this one out! Don’t forget to comment, reblog, and follow! Ok!! I’m nearing 70 followers, and I’m ecstatic. 🙂 Thanks to everyone who has supported me, you really do make my day. I’ve decided to do another mini giveaway since my first giveaway just ended (Congrats Fancieland!! :D), and I really wanted to open another one up for my new and old followers!! Open until April 20th, 2012. 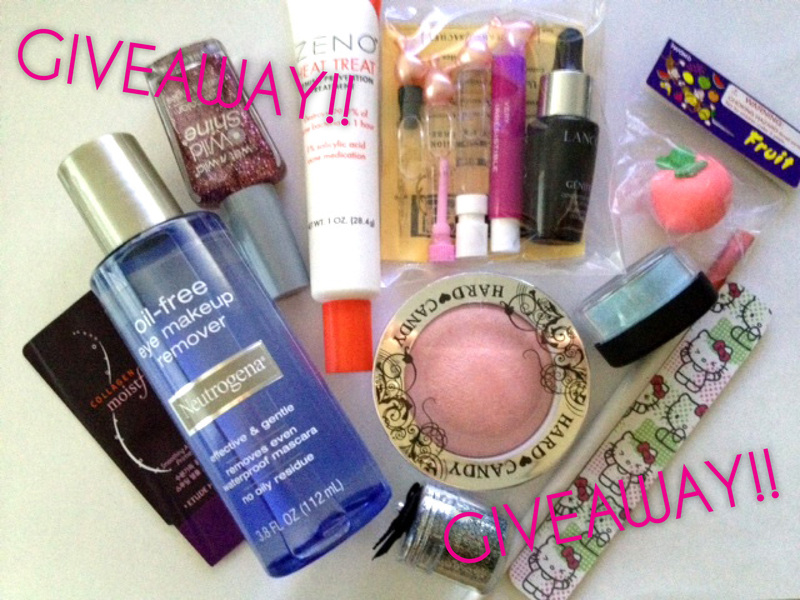 What you can win: Neutrogena Oil-Free Makeup Remover, Wet N’ Wild Pink Glitter Polish, Zeno Heat Treat Acne Prevention Gel, Hard Candy Baked Blush in Honeymoon, Custom Night Sky Glitter Mix for Nails, Hello Kitty Emery Board, Custom Vintage Blue TKB Pigment Eyesahdow, Kawaii Peach Eraser, Collegen Moistful Sample, Perfume Samples, Vitamin E Capsules, Detail Makeup Brush, Lancome Genefique Sample, and Tazo Calm Tea. 1. Must follow my blog! 2. Re-blog or post this on your Blog, Facebook, Twitter, etc. Yet another awesome giveaway for you my Fancies! Check it out! Be sure to like, comment, and follow! Now the fine print lol. In order to start this giveaway I need to reach 50 followers! So reblog this, post it, shout it from the rooftops to get the word out about this giveaway! Once I get the 50th follower this awesome e.l.f. giveaway will begin. Remember that fabulous Sedona Lace palette I swatched a little while ago? Well I’ve been experimenting with it and so far I like it! As you know, this palette features 88 neutral eyeshadows making it a fabulous palette to have for soft day time looks or smokey night looks!